Rivals Rally In Cairo As Egypt Uncertainty Continues : The Two-Way An attempt to install Mohamed ElBaradei as interim prime minister was stalled after an Islamist group objected to the Nobel laureate. State media and other sources had confirmed the appointment on Saturday, but later in the day the president's spokesperson walked it back. 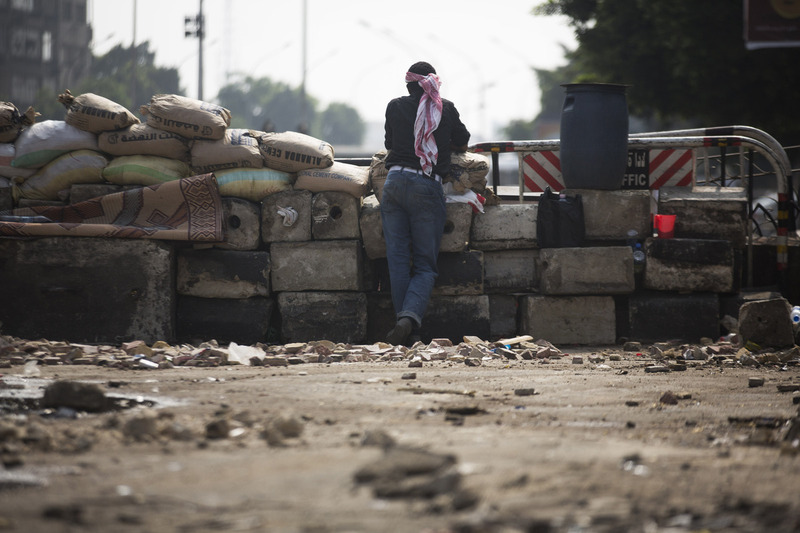 A supporter of Egypt's ousted President Mohammed Morsi stands guard at a barricade near Cairo University, where protesters have installed their camp in Giza, southwest of Cairo, Egypt, on Sunday. State media and other sources had confirmed Saturday that Mohamed ElBaradei, the former head of the International Atomic Energy Agency, would be Egypt's interim prime minister. Later in the day, the president's spokesperson walked it back. Egyptians remain deeply divided about which direction their country should go as supporters and opponents of ousted Egyptian President Mohammed Morsi are turning out Sunday to voice their opinions in separate rallies. "Hundreds of thousands of opponents of deposed President Morsi have come here, Tahrir Square, in the center of Cairo to show their support for the toppling of his government. "Meanwhile in another part of this sprawling city, a very large crowd is chanting for the return of Morsi from what they say is and illegal coup. "Morsi was removed by the military on Wednesday following street protest calling for his ouster. "Squabbling over the makeup of an interim government continues. Egypt has been without a constitution since Morsi's ouster." The protests come two days after clashes left 36 people dead and more than 1,000 wounded. "The abrupt U-turn came amid opposition to the appointment by the Nour Party, Egypt's second Islamist force after Mursi's Muslim Brotherhood movement, highlighting the challenge the military faces in finding consensus among liberals and conservatives on who should run the country." 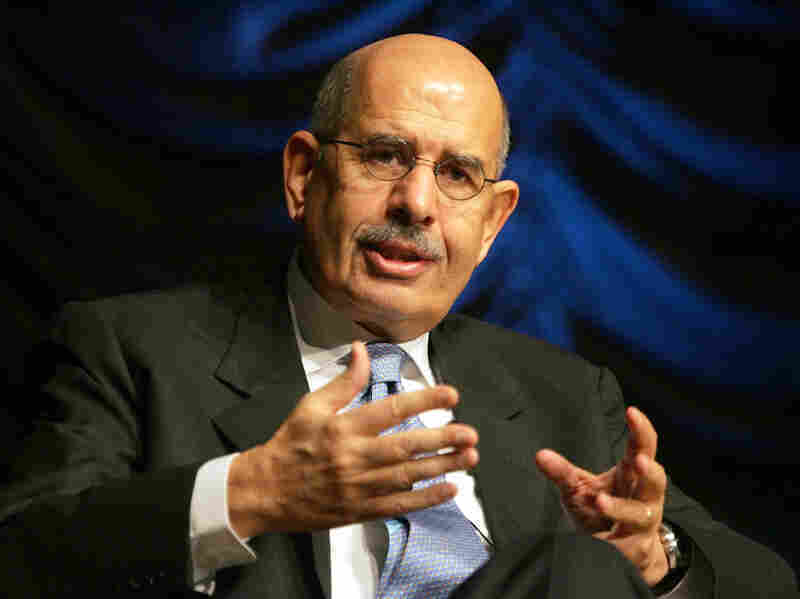 ElBaradei is a divisive figure in Egypt. The former head of the International Atomic Energy Agency is seen as a staunch secularist, and, as The Washington Post explains this morning,"many Islamists view ElBaradei as uninterested in giving them a say in Egypt's affairs." "'Baradei in a way is kind of the ultimate liberal,' said Shadi Hamid, an Egypt expert at the Brookings Doha Center. 'He has a very antagonistic relationship with the Muslim Brotherhood, which is why it doesn't bode well for Brotherhood reintegration' if he were to come to power." Over a dozen leaders of the Muslim Brotherhood, the party supporting Morsi, have been arrested since Egypt's military overthrew the democratically elected leader last week. NPR's Leila Fadel reports the Brotherhood is calling for rallies Sunday to "protect legitimacy," saying Morsi's removal is an affront to democracy. "The collection of liberal, secular and youth groups that spearheaded the campaign to oust Morsi, meanwhile, have called for a mass rally in Cairo's Tahrir Square later Sunday to support the country's new interim government."